In the Greek mythology you might have found the name Colchis, right? That was Western Georgian kingdom! Jason and the Argonauts were looking for the Golden Fleece here. In the Middle Ages this kingdom used to be blooming… In its Golden Age, XI – XII centuries, Kutaisi was the central city of united Georgian kingdom. The city is not super big now, but it still plays an important role in the life of the country (it is a seat of the Georgian Parliament). You will definitely find something interesting to see there and around it. In 7 km from Bagrati, there is another UNESCO Heritage site, Gelati Monastery. It has nothing to do with gelato, but its importance for Georgia is hard to describe. In the Middle Ages there was an academy, one of the biggest in the region, which was very famous. Scholars and students from the whole Black Sea and Caucasus area streamed there to study theology and philosophy. Finish the exploration of Kutaisi’s surroundings with a visit to Motsameta monastery. It is not in the list of UNESCO, but lovely, a bit hidden setting, beautiful park and a chance to tell your wish to the local saints David and Constantine, is a good incentive to visit it together with the other two churches. As you are back to Kutaisi, don’t hesitate to go to a restaurant with local cuisine and try Imeruli khachapuri – local kind of cheese bread, based on regional cheese. It is known not in Georgia only, but in the neighbour countries as well! Imereti, this region of Georgia, is famous not just for cheese, but also for small corn breads, mchadi. Combine it with cheese plate, salads with walnut sauce, and you will be happy! 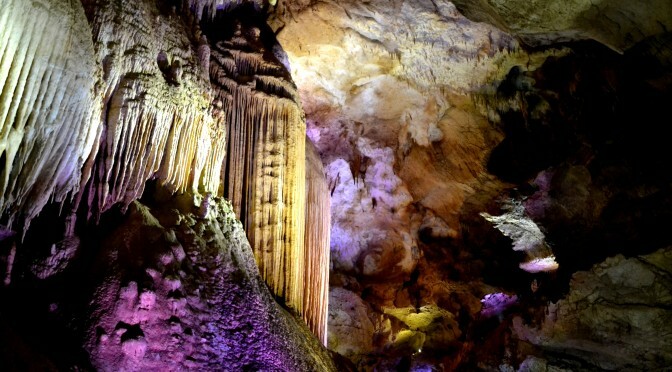 Nature lovers will enjoy a visit to Sataplia Natural Reserve. It used to be a place, where the bees places their nests on the rocks (hence the name: “taphli” means “honey” in Georgian). The protected area is full of rare local plants, and it offers you an unforgettable experience of walking on a transparent panoramic platform. Breathtaking! And the most exciting thing about this place is a beautiful carst cave, where the footprints of plant-eating dinosaurs have been discovered by the scientists! There is another bigger cave in the area. Its name is Prometheus Cave – you see, the Greek mythology pops up again, as it is believed that Prometheus was punished buy the gods here, in the Caucasus mountains. Walk along the empty bed of a huge underground river, be fascinated by the greatest sculptures, made by nature, and make a boat trip along the underground lake! Another natural attraction of this region, Imereti, is Okatse Canyon. Getting there from Kutaisi will take 40-60 minutes. This protected area offers you a short beautiful hike through the forest to a thrilling experience of walking along the hanging pathway to the panoramic platform. Growing river, green mountains and fresh air plus a bit of adrenaline – oh, you will love it! In this very area, on the way to Kutaisi, there is a spa town Tskaltubo. It is not fancy, but you will find very decent hotels, which offer great spa treatment with local mineral waters. Those waters can do magic with your body! Even Stalin liked it here. You can still have a bath in a bath hall, where he gave in to curative water procedures. By the way, Georgia is not just country of old culture, great nature and healing springs. It is also a home of 8000-years-old winemaking culture! If you have enough time, try to go to winemaking region of Kakheti, which is the biggest in the country. If you are not into covering huge distances, you can go to Baghdati village, where you will find two small, but famous wineries. They belong to Gaioz Sopromadze and Zurab Ghvaladze. Next to the town Terjola there is also a big wine store of Khareba, one of the biggest national wine factories. The best local grape sorts are Tsolikouri and Khikhvi (both white). You have to try the wine, made of them! In 1.5 – 2 hours drive from Kutaisi there is a rural region Racha, which is perfect for hiking and wine tasting. Tiny towns Ambrolauri, Bugeuli and Tsageri are the places, where the most rare and expensive wines are being grown in their special micro zones. Remember Khvanchkara, Aleksandrouli, Usakhelouri – those long and hard-to-pronounce names taste the best! Racha is not super developed for mass tourism, so you can be a pioneer in discovering its natural beauty and bottled treasures. You see, even though Georgia is a very small country, you will need at least two or three days to see the best places of one region! Start your exploration of Georgia this autumn, and you will be eager to come back and experience more and more! Hi Dariko, we visited Kutaisi this year, and I must agree with everything you wrote about Kutaisi. Our best experience was definitely Okatsee, and the hanging patway with amazing view. On the way we stopped by Kinchkha waterfalls which I would also recommend. Georgia has a beautiful nature, friendly people, and excellend food. I will definitely go back and visit other places. All the best and have a nice day Cs.